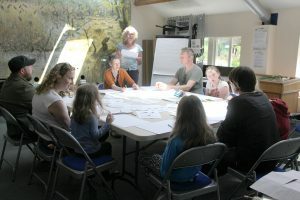 The first Chirp&Drift workshop took place on 27th May at RSPB reserve Leighton Moss, in collaboration with Sarah Hymas and Laurence Rose. 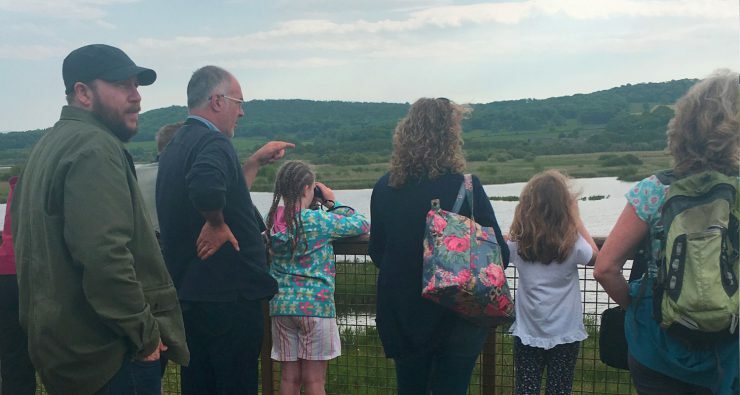 We invited ‘family pairings’ of one adult to one child to take part and were greeted with a wonderful group of open, sharing and friendly creative participants at the stunningly beautiful Leighton Moss reserve, with the sun shining. 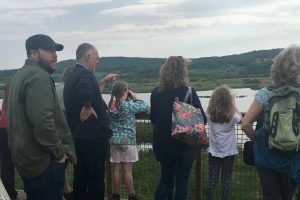 The day began with an inspiring walk around Leighton Moss with Laurence. We ascended the sky tower to look and listen to the surroundings… many many observations. 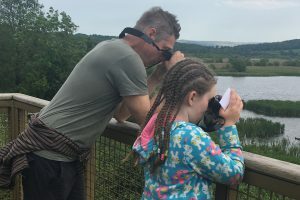 Alongside watching birds close up through binoculars, we considered the many different types of habitat at Leighton Moss; watched the reeds moving in the wind, and took time to listen very closely and carefully to pick out the sound of sedge warblers, swifts, reed warblers, and the occasional honk from the geese. As we walked continued our walk at ground level, we kept our ears and eyes highly tuned. We frequently picked up the confident song of the wren bursting from the undergrowth and experienced some closeup visits from the friendly robins. 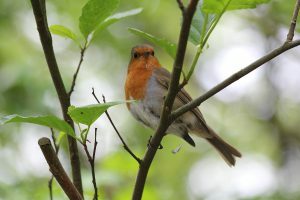 We saw and heard a male robin feeding a female, and when that happens, she makes a kind of ‘hissing’ sound. 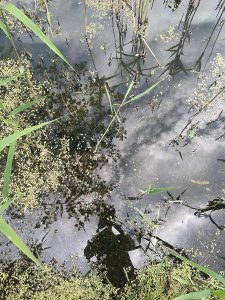 We stopped off at a pond to listen to some underwater sounds. 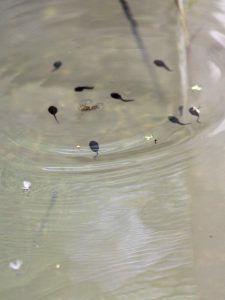 We could see many tadpoles visible, plus the occasional fish. 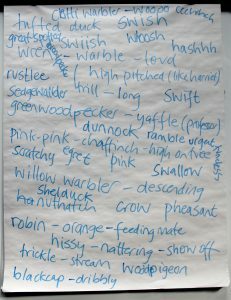 There must have been many more invertebrates living there as it sounded full of life! – recordings to follow shortly. 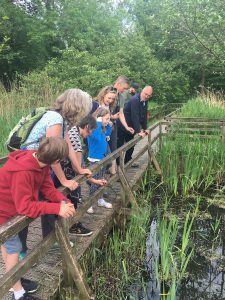 As we wandered into the reed beds, we could imagine the perspective of the birds living in the reeds. 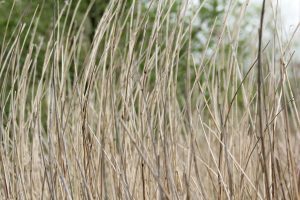 We listened closely and heard more sedge warblers… And, being so close to the reeds now, we could clearly hear their crackly movements in the wind. 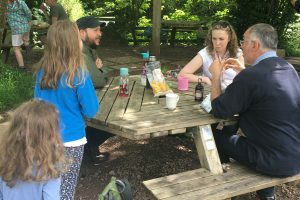 After a tasty picnic lunch with Robin accompaniment – we went into the holt (a workshop room at Leighton Moss, but also the name for where Otters live!) to start the afternoon with an inspiring workshop led by poet Sarah Hymas. 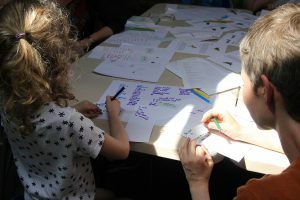 Through series of creative exercises – working in family pairings of one adult to one child, short, poetic, bird-esque conversations were invented… starting from what birds might say to each other in the nest, to incorporating made up ‘sound’ words to generating an improvised flock of words from everyone… it was a wonderful experience! 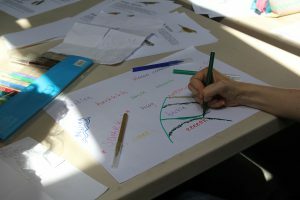 The next part, I led – inviting the participants to use their words as a starting point for some sound experiments. 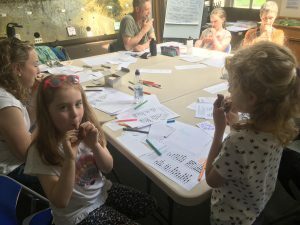 First of all we converted some of our favourite words into morse code and performed them on swanee whistles and other bird-imitating whistles and noise-makers. 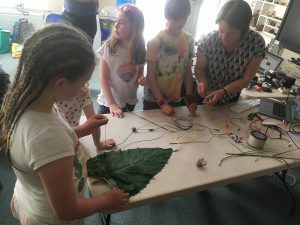 We then developed our ‘ensemble’ to bring pieces of our ‘nests’ (some interested foliage gathered on the morning walk) and we hooked them up to a ‘makey-makey’ so each leaf triggered a sound from the computer. We began with simple tones and decided if we wanted to ‘tune in’ and blend together – or ‘re-tune’ to be different and stand out… it was more chaotic than that though! We then used our ‘nest-keyboard’ to trigger samples of some of our bird-sounds made earlier in the workshop. Then – the swanee whistles joined in again, and we tried to create a gradually building ‘flock’ sound… although it was not all that gradual, I hope fun was had by all. 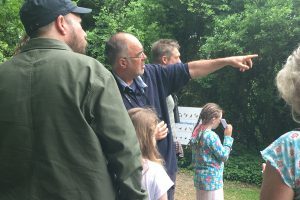 Many thanks to Leighton Moss for supporting “Chirp & Drift’ with the use of the Holt and for Lancaster Arts for coordinating the day.